Rev. 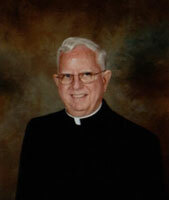 Dennis J. Gallagher, O.S.A., Ph.D., University archivist, celebrated his 45th anniversary of priesthood on January 30. He was ordained in the St. Thomas of Villanova Church on the University campus. An anniversary mass will be celebrated on this occasion at St. Catharine’s Church, Spring Lake, New Jersey. Congratulations to Father Gallagher; he use to teach at Austin Prep in Reading Massachusetts and all the students thought he was a very caring respectful and patient teacher. He was very much respected by all.